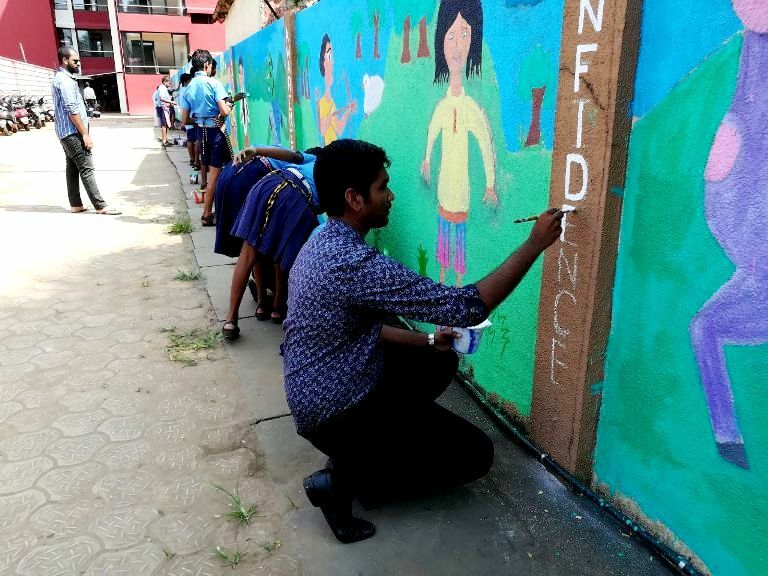 This five-day workshop focused on engaging young learners in a collaborative exercise of mural making with artist Ruchin Soni. 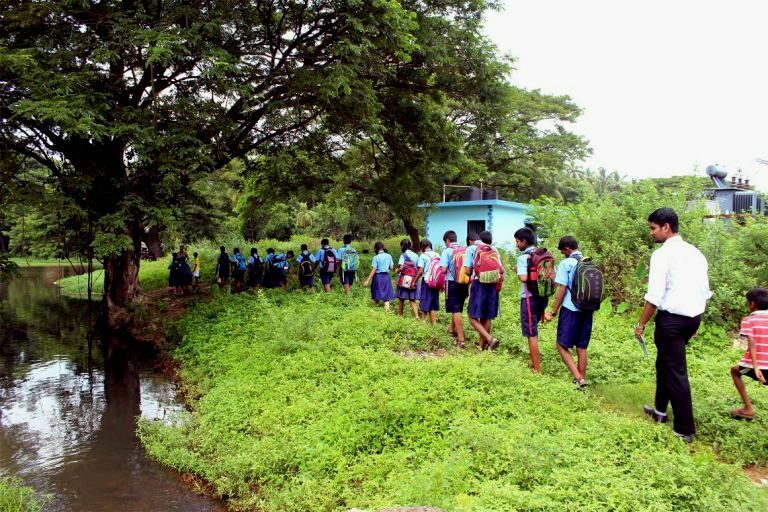 With the artist Vishal Rawlley taking them on a field trip to the St Inez Creek at Camrabhatt, the children began the exercise by taking a walk by the water body and discussing the environment around them. The workshop was based on the parlour game called “exquisite corpses” from the early twentieth century, which was played by the surrealists to create a string of strange new characters that supposedly inspired their work. This activity builds confidence and encourages children to approach art making in a fun way. The kind of figures that emerge from the game are very unique and unexpected, highlighting the element of spontaneity. The nature of this activity breaks all barriers of expectation and takes away individual responsibility to create a collaborative artwork. 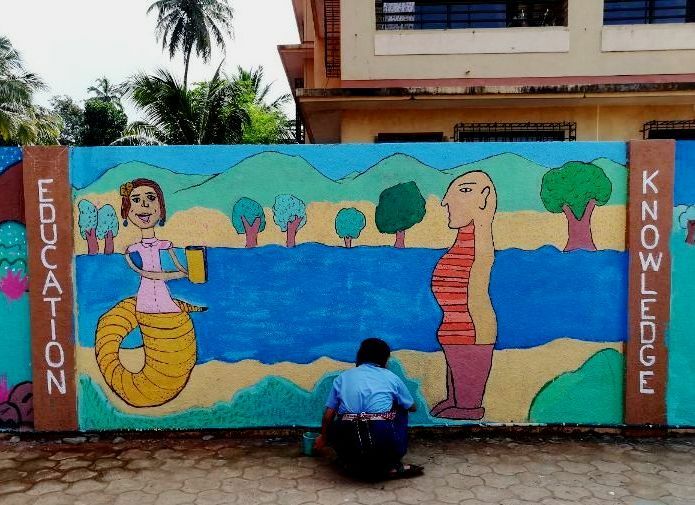 Here every art work has its own character and a story to tell, which gives kids a sense of achievement and the satisfaction from having created it. The aim for this art workshop is not to create beautiful images but to experience a sense of freedom in art which may be missed at the school level. The process of creating art becomes very repetitive and predictable. To therefore bring about a change and give their imagination a boost, Ruchin Soni decided to use this game to help the children think out of the box. This helps students look at a situation from different perspectives. It opens up their mind to risks and new possibilities, where good drawing becomes a secondary skill and creative thinking around the medium becomes the primary focus. 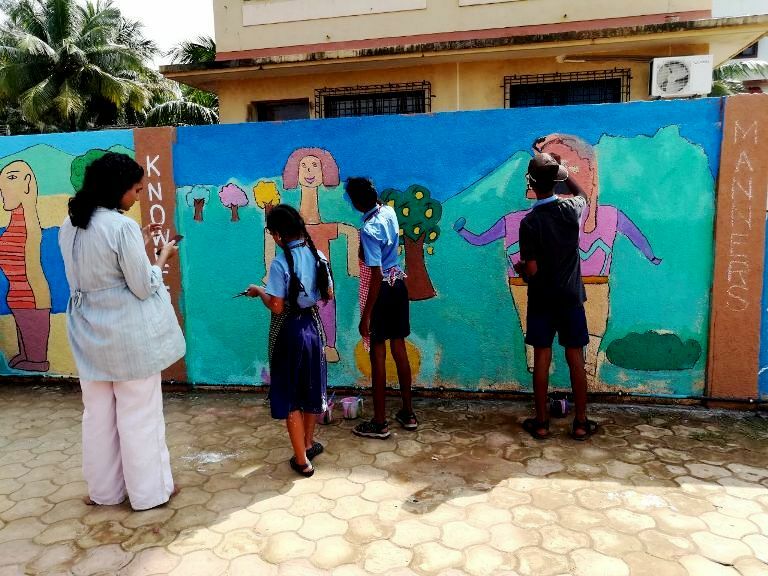 A wall will be turned into a canvas for the duration of the workshop as the students learnt about the challenges and thrill of painting on a grand scale. Ruchin led them through the steps of planning the composition, sketching on the walls, and finally the act of painting. They also learnt about various techniques used in mural making, developing a project as a team, and were ntroduced to the basics of street art as a contemporary urban art form. 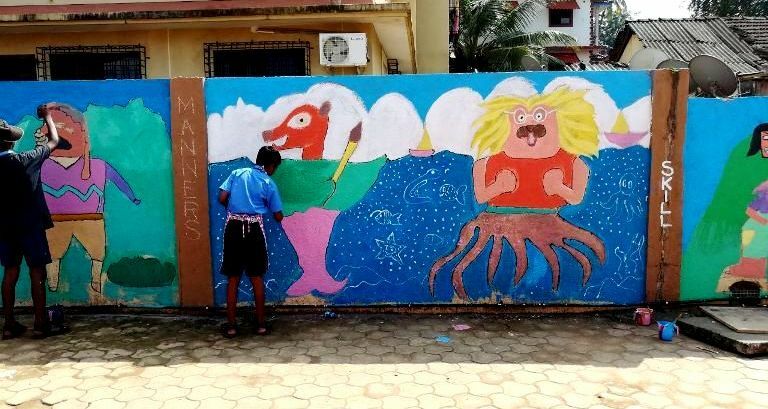 The workshop was thus an attempt to get the children to think creatively, to break stereotypes and to have fun while painting a wall. Ruchin Soni hails from a family of traditional painters in Gujarat, and was initiated into the world of art during his early childhood when he learnt traditional painting techniques from his parents. He formally trained at the M.S. University of Baroda specializing in painting and mural, and specialized in mural design. 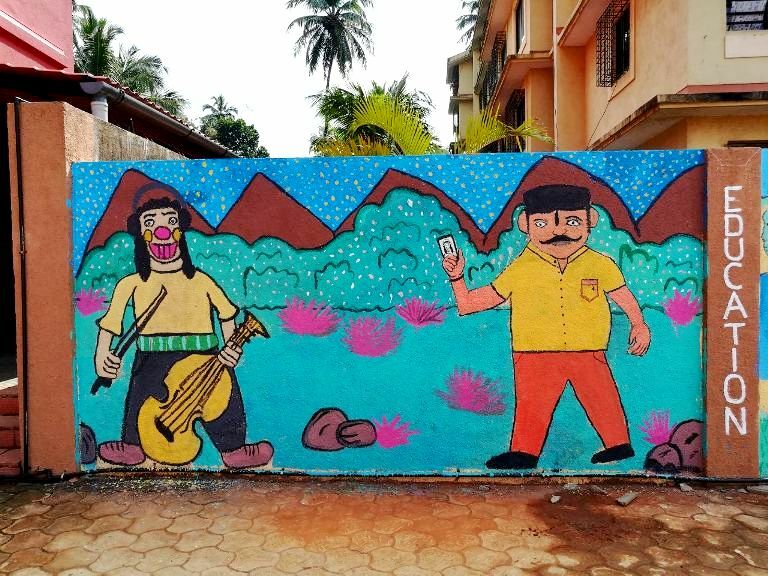 Ruchin has created several murals in India and Mexico. He has been a part of the Street Art Festival in Delhi since its inception, and his works adorn the walls of Shahpurjat, the Rain Basera on Mahatma Gandhi Marg, as well as India's longest mural at Tihar Jail in New Delhi. 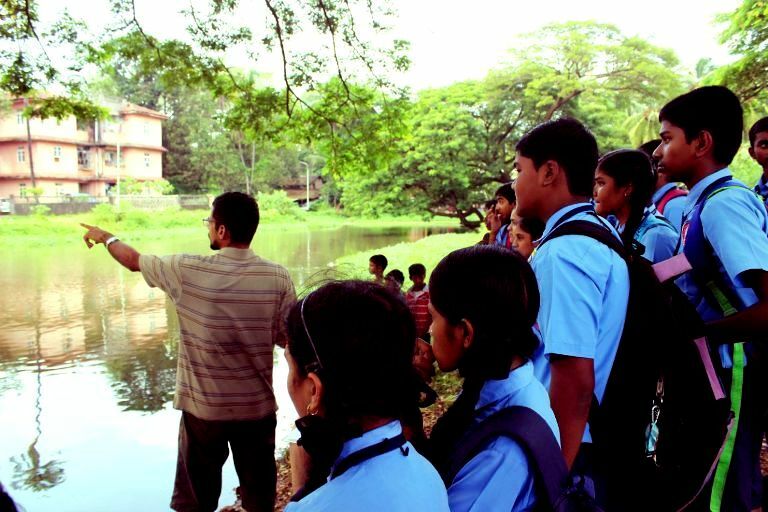 Ruchin is also an art educator, having taught and developed curriculum with Welham Girls School, Dehradun, and Auroville School, Pondicherry, and conducted teacher training programmes with Flow India.